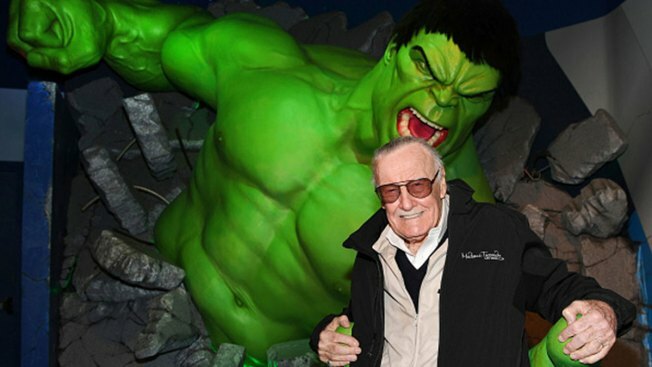 Stan Lee poses with a wax replica of The Hulk at Madame Tussauds Las Vegas Feb. 28. Comic book icon Stan Lee will officiate a wedding at the Big Apple Comic Convention Friday at 6 p.m.
Stan Lee is notorious for his beloved Marvel Comics empire, but did you know he'll be a wedding officiant? The comic book icon will officiate a wedding Friday at the Big Apple Comic Convention between comic book maven and convention co-founder Mike Carbonaro and his bride, model Nina Martinez. Martinez will don Wonder Woman couture in lieu of a traditional white wedding gown for the 6 p.m. soirée. Comic books aren't the only thing you can find at these kinds of convocations: the couple found love at a Dean Martin and Jerry Lewis convention, where the buxom bombshell was dressed in a Super Girl costume. Carbonaro says it was "love at first sight." The 94-year-old graphic novel empresario will be in attendance the entire weekend of the convention. He'll be accompanied by several celebrity guests, including Jon Bernthal from "The Walking Dead" and "Daredevil", "300" writer and creator Frank Miller and Barbara Eden from "I Dream of Jeannie". Graphic novel fanatics will find a wealth of paraphernalia, including original artwork by Miller, which will be up for sale at the Metropolis Gallery booth. The convention will run from Friday, March 10 to Sunday, March 12 at Hotel Pennsylvania's Penn Plaza Pavilion. If you were hoping to take your date on the first night, you're out of luck, as Friday's tickets are sold out, but there are still plenty available for Saturday and Sunday. A one-day ticket will cost you $32.50 for adults and $11.50 for kids, while a two-day general admission ticket costs $53.50. For comic book heads with money to spend, a ticket to the noon or 5 p.m. autograph session with Stan Lee will run you $132.25, and limited VIP packages range from $211 to $290. You can purchase your tickets here. New York City's oldest comic book convention will be open from 4 p.m. to 7 p.m. Friday, 10 a.m. to 7 p.m. Saturday and 10 a.m. to 5 p.m. Sunday at the Penn Plaza Pavilion. Live long and prosper!